Painting of Jeff Goldblum (w/ Jeff Goldblum) made for TV commercial. Weid Al Yankovic w/ custom drumset made/painted for a video of his. 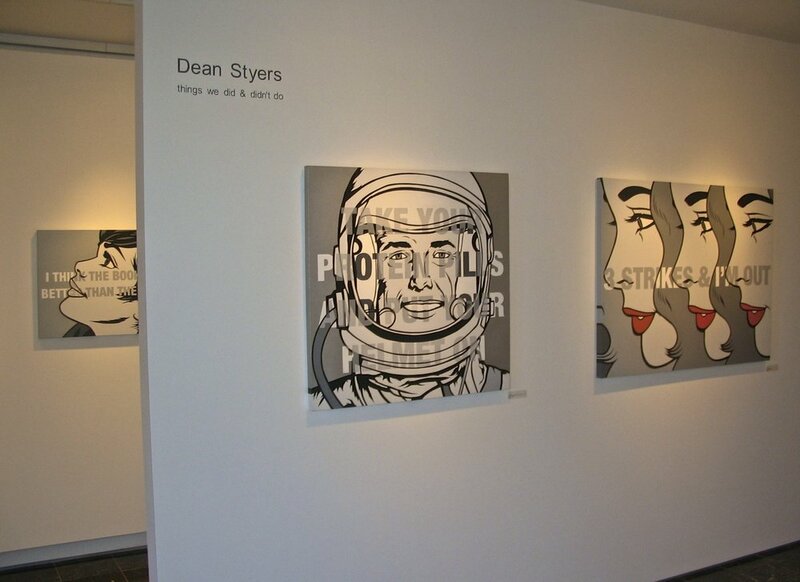 "Everything beautiful is far away" Solo show @ Bergamot Station, Santa Monica CA. "Everything beautiful is far away" Solo show install. Santa Monica CA. George Clooney painting made for CAA "Oceans 12" commission (Collection of George Clooney) Acrylic on canvas, 24"x24"
Steven Soderbergh painting made for CAA "Oceans 12" series/commission (Collection of Steven Soderbergh) Acrylic on canvas, 24"x24"
Brian Lourd painting made for CAA "Oceans 12" commission (Collection of Brian Lourd) Acrylic on canvas, 24"x24"
Don Knotts stencil in Echo Park (Los Angeles) CA. Cove art paintings/graphics/stencil for the Chris Brokaw "Stories" 12" record. Limited Appeal Records logo design. Stencil piece for Dave Brockie (of Gwar) tribute show "Don't talk about it, do it". Painting on set of Netfix's "Love"
Painting on "2 Broke Girls" TV show. Stencil of Boris the dog. "Teddy" stencils installed in home of "Bobs Burgers" executive producer. The Jesus Lizard/Brainiac poster design/screenprint.